Soaked then baked potato wedges seasoned with citrus juice or vinegars and spices, then baked to crispy perfection. You would never know they are healthy! Before you cut potatoes into wedges, you need to scrub their exteriors thoroughly to remove dirt. You can peel the potatoes if you prefer, but it's not necessary. For even-sized wedges, slice a potato in half, lengthwise, lay the halves flat and slice them into thirds, or however many sections suits the size of potato. Soaking the wedges in warm water will extract some of their starch. When the starch content lowers, more moisture can escape during the baking process, resulting in crispier wedges. The longer the wedges soak, the better, but they shouldn't require more than a few hours. When you're done soaking the potato wedges, pat each one dry with a paper towel before proceeding. If this is too hands-on for your preference, you can air-dry them in an even layer on a baking sheet in a warm area. To prevent using oil in your potato wedges, which adds exorbitant amounts of calories and fat, you'll adhere the seasonings with liquid. Fresh lemon, lime, orange or grapefruit juice works well, as does balsamic or red wine vinegar. Toss the potatoes with enough liquid to coat them thoroughly, then add seasonings. Ground black pepper, crushed red peppers, paprika, lemon pepper and ground cloves are examples of healthful seasonings to use. Fresh or dried herbs work well, too; parsley, cilantro, basil or rosemary is tasty on potato wedges. Minced garlic, onions and shallots are also delicious options. Don't add salt or salty ingredients. Once the potatoes are seasoned, dump them on a baking sheet and spread them evenly. Potato wedges require between 40 and 70 minutes to bake completely. You'll want to preheat your oven to 400 degrees Fahrenheit and place your potato wedges on a light-colored baking sheet. Darker baking sheets can result in burning. If you don't have a light baking sheet, line what you have with parchment, a silicone mat or aluminum foil. Flip the potatoes and stir them around at least once, or up to four times, during the baking process. Check them frequently to prevent burning. Remove the wedges from the oven when they are crisp, lightly browned and have fluffy interiors. Leftover potato wedges will not have the balance of crisp moistness that they did when they were fresh. However, they'll still be tasty if you reheat them properly. Either place a paper towel over them to retain moisture while they microwave, or reheat the wedges in a warm oven to refresh the crispiness. 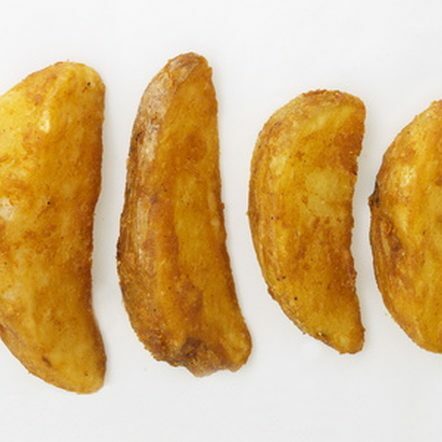 If you used russet potatoes, the wedges from one medium potato will have 168 calories. With sweet potatoes, the yield from one large potato will have around 162 calories. Sweet potatoes have the bonus of 34,592 international units of vitamin A per serving, whereas a medium russet potato has just 17 international units. Sweet potatoes are also more flavorful and can require less seasoning.